Sheerness is a small town and port located on the north-west corner of the Isle of Sheppey in north Kent. It began as a fort strategically positioned at the meeting of the River Medway and the Thames Estuary. Following the Napoleonic Wars, Sheerness Dockyard was upgraded and built to the designs of the engineer John Rennie the Elder. Edward Holl and his successor George Ledwell Taylor were the architects responsible for executing Rennie’s designs. 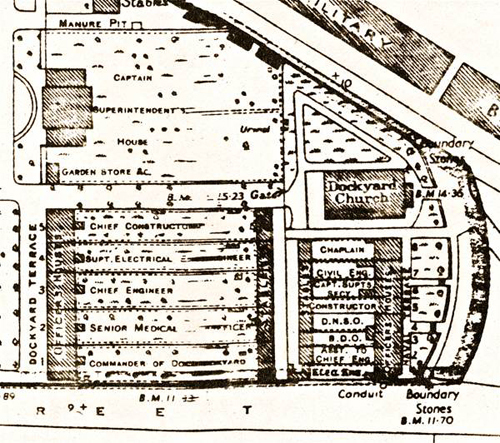 The site was leveled in 1815, and over the next 15 years the new Dockyard was laid out. It was unusual among dockyards in the unity and clarity of its design, having been built in one phase of construction, of a single architectural style according to a unified plan (rather than developing piecemeal over time). In all the project cost £2,586,083 and was completed by 1830. 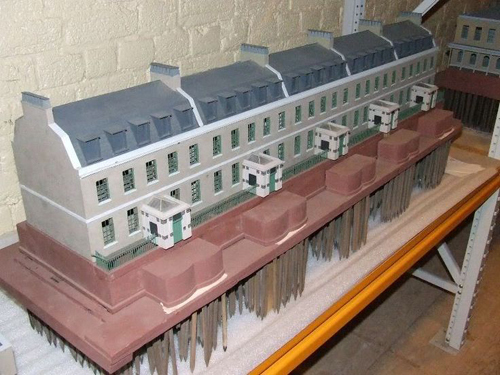 A full-scale model created at the time, which still exists, shows how much of the original remains. From the completion of the dockyard until 1960 Sheerness was one of the bases of the Nore Command of the Royal Navy, which was responsible for protecting British waters in the North Sea. The command was named after the Nore sandbank in the Thames Estuary, about 3 miles (5 km) east of Sheerness. In 1797, discontented sailors in the Royal Navy mutinied just off the coast of Sheerness. 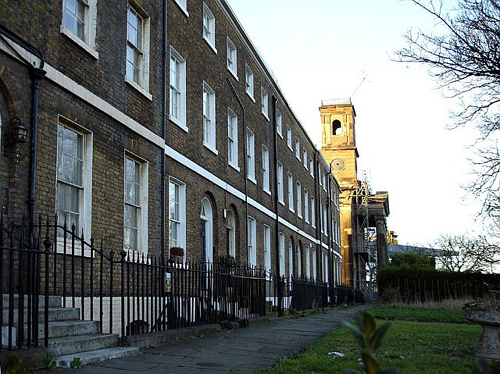 Amongst other buildings the residential quarter includes the five houses in Dockyard Terrace (now known as Regency Close), Naval Terrace, the Captain Superintendent’s House, The Boatswain’s House and the Dockyard Church. The houses in the two terraces were tenanted by the principal officers of the dockyard and their families from the time they were built until the Royal Dockyard closed in the 1960s. At that stage it was turned over to commercial use with the loss of thousands of jobs, devastating the local community and wiping out part of the town. Today, Sheerness is the country’s largest port for motor imports and very little of Rennie’s dockyard survives apart from the residential quarter. Sold off to developers at the end of the twentieth century, the terraces were left to decay and the church was burnt out in 2001. 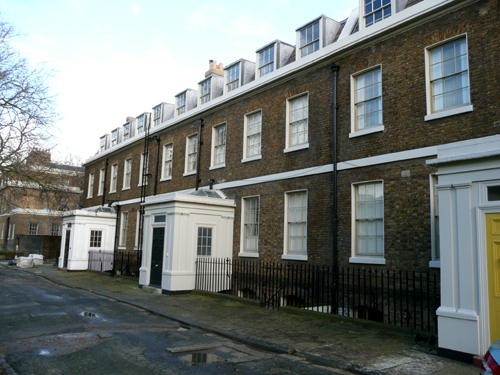 However, when plans to build blocks of flats on the site fell through in 2010, the Spitalfields Historic Buildings Trust was able to step in and buy the four acre plot with the assistance of a loan from the Architectural Heritage Fund and a handful of brave investors who took on individual properties. Since then the houses which, with one exception, had been empty for decades are undergoing restoration work with the support and expert guidance of the Trust. I was asked to provide advice and paint for one of the houses. Hello, I was given your name by Sarah Waldock. I wonder if you could help me. I have been envolved as a volunteer for the last 13 years with Holywells Park, Ipswich, History. It had a grand mansion, demolished 1962-3, of which only black and white photos survive. I have been unable to find a sensible high Victorian colour palette online (Dulux and Farrow and Ball don’t seem correct from my instinct). Holywells was the home of generations of Cobbolds all of whom were Conservative MPs. Is it likely the chose some form of blue for doors and window shutters? Could you possibly direct me to a suitable colour tone (of couse they could have been green or brown but we don’t know) Also the window glazing bars would have been painted in a lead based oil pain, but to make them stand out in the computer anitmation of the reconstructed house we really have to use a light colour such as an off white – any colour you can point me to? Thanks in advance for any help you may be able to provide. It would nice to get the computer animation of the reconstructed house as authentic as possible.